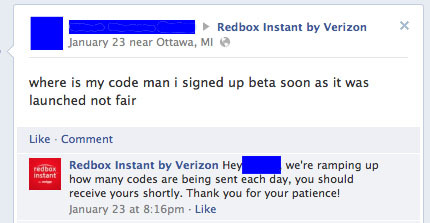 Last month we got our beta access code for Redbox Instant, the long-awaited streaming venture from Verizon and Coinstar. Redbox offers 3 different pricing tiers: $6 for streaming only, $8 for streaming + 4 DVD rentals per month, and $9 for streaming + 4 Blu-ray rentals per month. And like Amazon, Redbox Instant allows you to rent or purchase digital movies also – but you can’t apply your rental credits for digital rentals. That’s $5 extra, on top of the monthly fee. 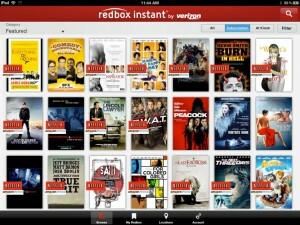 Redbox Instant is available on iOS and Xbox360, plus web browser. There aren’t apps for Android, or for any other streaming devices yet, but Redbox says more are coming soon. 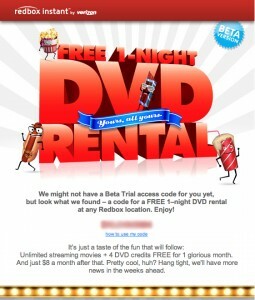 Also: Redbox Instant is all movies, no episodic TV – a major drawback in my opinion. If you’re not going to do TV, you’d better at least do movies better than the other guy. And unfortunately, Redbox doesn’t. The streaming performance leaves a bit to be desired as well. When using the Redbox app on my iPad at the farm, I noticed that it didn’t fare nearly as well on my slow (<5 Mbps) connection as the Netflix app does – the video frequently ran out of buffer. But that can be fixed – as you may remember, the Amazon Instant Video app for iPad had some issues in its early days too. 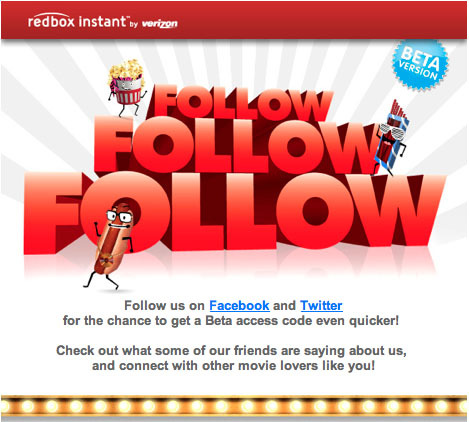 Let us say this in Redbox’s favor: They’re for-real interested in hearing from we Beta testers about how to improve the service. In addition to engaging followers on Facebook and Twitter, Redbox Instant is using “gamification” to get feedback from its beta testers via the Redhead Nation website. I’m not a betting person, but I’d guess they’ve got a lot of air fresheners and only one Xbox in the hopper. 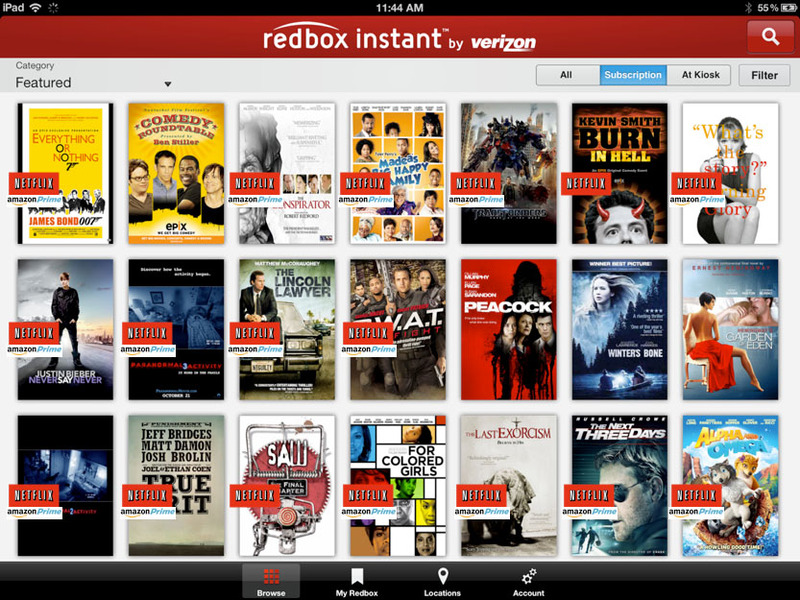 Not so shocking conclusion: So far, Redbox Instant leaves a lot to be desired – namely, more content on more devices. Even though the $6/month we’re paying for streaming-only access is a bit cheaper than either Netflix ($8/month) or Amazon Prime ($8/month or $79/year,) those still feel like a better value. 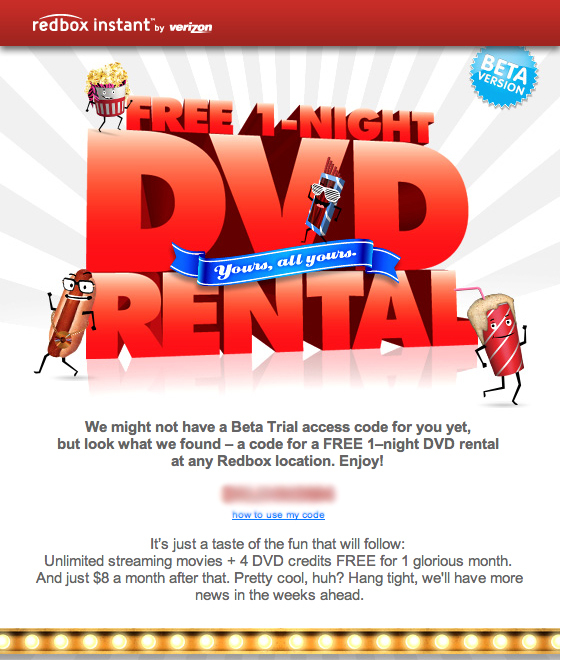 Netflix killer it’s not, but if they listen to their beta testers and seriously ramp up the content and device selection, maybe Redbox Instant can at least play in the same league. The “gateway” – half cable modem, half set-top box – is slowly advancing into American living rooms, as part of the gigantic transition to video distribution based on Internet Protocol. That’s jargon for “through the cable modem, to screens that connect that way,” instead of through the old fashioned juncture between the set-top box and the television. Which raises this question: Will cable operators be required to keep buying boxes with a CableCard slot, and spending $50 per CableCard, as set-tops morph into gateways? Answer: Yep. It’s a law that’s still on the books, and it goes like this: If you make a two-way, high definition box, you need a CableCard. And then there’s the “even thoughs:” Even though every TV maker in the land stopped making TV sets with CableCard slots. Even though the FCC itself is anything but hot on CableCards. Even though there are deployable alternatives – like the unheralded but significant work Comcast did to make its digital terminal adaptors (DTAs) capable of firing up in either major security mode (Cisco or Motorola), without CableCards. On the “What the…” meter, this registers somewhere between ridiculous and nefarious: You’re ordered by law you to do something you already do (secure content) — but differently, and in a way that you costs a lot more. You do it. None of your competitors have to do it. Just you. Later, the industry segment that initiated the law in the first place (consumer electronics companies) stops supporting it. The enforcing agency (FCC) repeatedly backs away from it. What will happen? Keep an eye on Charter, led by the guy (Tom Rutledge, CEO) who led Cablevision when it got its CableCard waiver, back in 2009. 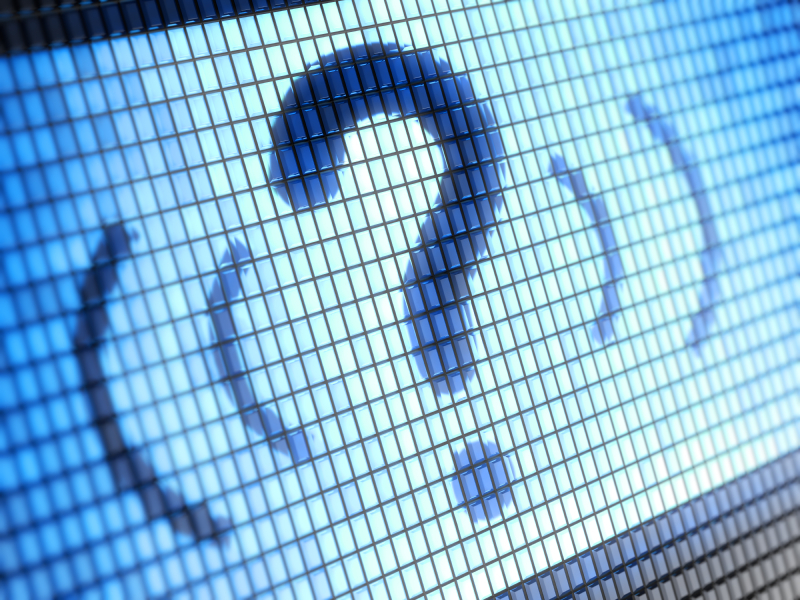 Its November 2012 request for an FCC waiver could be granted or denied any day now, and could set the tone for what happens with CableCards inside gateways. Also watch for proponents of “AllVid” (Best Buy, Google, Sony, TiVo, and others) to re-emerge, proposing ways to do things that are already happening, in-market — as though they aren’t already happening. That’s a short look at the very long, complicated and expensive history of cable and CableCards. More to come. Amazon struck a deal to expand their content agreement with CBS, which adds several more series, including the Showtime series “United States of Tara,” to the Amazon Prime catalog. The deal also includes in-season access to Stephen King’s “Under the Dome” on CBS this summer, with episodes scheduled to hit Amazon Prime 4 days after air. This means Amazon is shifting its Prime model to include current season streaming, similar to Hulu. Amazon already offers unlimited streaming to its $79/year Prime members; its “Instant Video” service lets one rent or buy a title without a subscription. It’s worth noting that Hulu hasn’t yet carried current CBS content in its catalog — only the old shows. We’re guessing this has something to do with the fact that Hulu is owned by NBC Universal Television Group, Fox Broadcasting Company, and Disney-ABC Television Group. As in not CBS. Ya think? Notably, Comcast secured exclusive cable-VOD streaming rights to all three seasons of Downton Abbey, and purchased rights to stream first two seasons of the show on its Xfinity Streampix service. Watch for some original programming coming from Amazon, too – like the comedy “Alpha House,” the musical comedy “Browsers,” and “The Onion Presents: The News” — a comedy set behind the scenes of the Onion News Network. Amazon plans to film a total of six different pilots, then allow customers to decide which should go on to a full series. Meanwhile, Netflix premiered its second original series, the political drama “House of Cards,” on February 1st. It beat out both AMC and HBO for the rights to this show, an adaptation of a BBC miniseries, back in 2011. The entire 13-episode first season of House of Cards hit the Netflix queue at once, which created a massive buzz, in TV circles, and is a huge departure from the way episodic TV has ever worked. Netflix has several other original series on deck as well: Eli Roth’s “Hemlock Grove” is coming in April; the revival of the Fox comedy “Arrested Development” in May; and comedic drama “Orange is the New Black,” from “Weeds” director Jenji Kohan, later this year. Netflix also purchased the exclusive rights to air the new series “Derek” (from Ricky Gervais, creator of “The Office”) after its run on channel 4 in the UK – no word on the Netflix release date for that one. There’s no telling which of these shows, if any, will be a smash hit. One thing is clear: the fragmentation in the OTT content world continues. 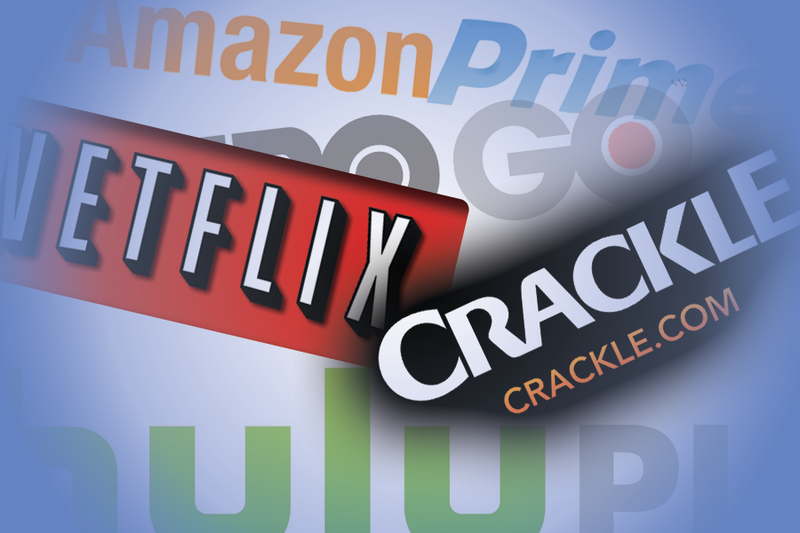 With OTT distributors releasing original content, it might only take one hit show (or children’s series for that matter) to rocket one of these service providers right up to “essential” status alongside the pay TV bill in household budgets. But what happens then? Most people today are using OTT services in addition to, and not instead of, the cable/telco/satellite cord. As more original content is created, will we eventually reach a point where some popular shows are spread out across all the subscription OTT services, as well as basic or premium networks, like AMC or Showtime? And if that’s the case, will people be willing to sign up for several different streaming services on top of their payTV subscription? Or, maybe we’ll see payTV operators begin to pick up original content from the likes of Netflix and Amazon instead (as we saw with Hulu in Canada this past summer.) There’s only one bet I’ll make with any confidence: it’s going to be an interesting year of watching TV. The Boxee Box is a favorite in the lab — its quirky shape never fails to grab the attention of visitors, but the real beauty of the Boxee Box is that it handles virtually every file type we throw at it. Plus, it organizes (DRM-free) video from your networks and USB hard drives with thumbnails and metadata it pulls from the web. Alas, Boxee discontinued the Boxee Box this fall, making it “televestigial” – joining the ranks of the many devices in the lab that were discontinued or replaced by new hardware. So we’re part lab, part OTT museum at this point. 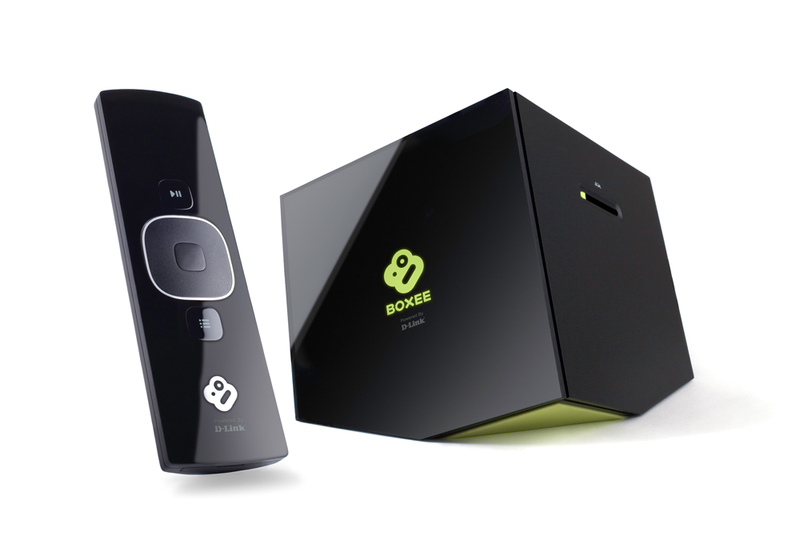 Boxee is instead focusing all its resources on Boxee TV, a device centered around linear TV which has some of the same features as the Boxee Box, but in a much plainer package. 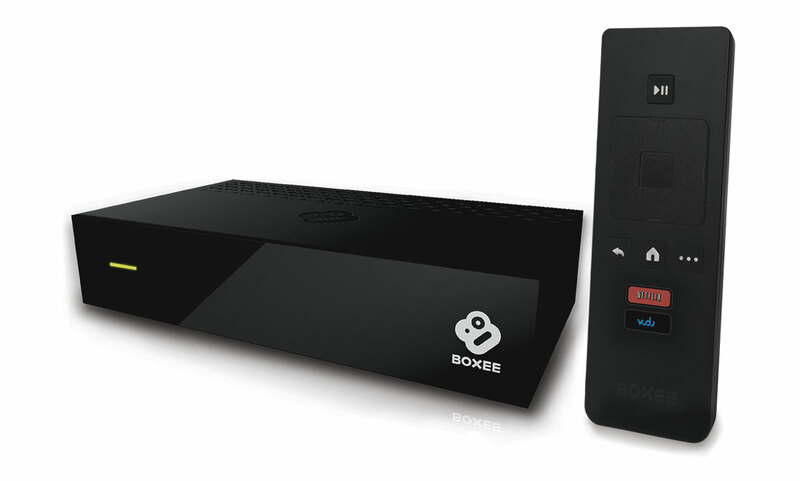 We’ll give a detailed review of Boxee TV in a separate post, but suffice it to say that while it is a fine device that’s less expensive and more accessible to non-techies, we’re still sad to see the Boxee Box relegated to the dust pile. 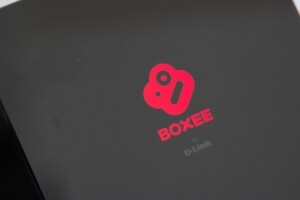 Fortunately, Boxee supports the use of 3rd-party app repositories (meaning that you can install outside apps on the Boxee Box), and some hackers figured out how to get the Boxee Box to run custom code from a USB drive. So even though Boxee is no longer supporting the Boxee Box, developers can still write new software for it. And naturally, there are plenty of developers/hackers to be found in the community of Boxee enthusiasts. In fact, there is already a new project called Boxee+, which I installed on one of our two boxes last week. Boxee+ also boasts faster HD streaming and a faster UI (more on that in a bit), plus some changes under the hood including telnet root access (for the non-geeks in the audience, root access is basically like a back door into the kitchen –- you can get in there and mess around with low-level stuff, such as running custom apps and even completely replacing the operating system, depending on the device.) Boxee+ also includes FTP access, so you can add remote file shares. How does one go about installing Boxee+ on a Boxee Box? From the usability standpoint, installing Boxee+ is pretty simple. However, know going in that installing Boxee+ will most definitely void your warranty, and there’s always a chance it will brick your Boxee Box, so it’s not for the faint of heart. Visit the Boxee+ website for the step-by-step instructions, and then read on for a few helpful hints from yours truly. To install Boxee+, you just have to download a file, unzip it, copy the contents to a USB drive, and then enter a few strings of text on the Boxee Box. It should take about 5 minutes, unless you happen to have two Boxee Boxes in the same room. As I was typing in the string of text, suddenly the Boxee Box seemed to have a mind of its own. It would alternate between not responding to signals from the remote control and getting stuck on them, so when trying to type “Boxee” I would get “Boooooooooooo” and then I’d backspace through about half of the extra letters before that key got stuck and deleted the entire string of text I was trying to type. Lather, rinse, repeat. Helpful hint: if your Boxee Box ever starts doing this, hold the remote control up against the LED on the front of the box and hold the center (“OK”) button for about 15 seconds to pair the remote. Since I’d just completed the first step of the Boxee+ install, I initially assumed that was the source of the problem. Then I realized the remote control still had the original battery from 2010, so I tried that first (which involved going to buy batteries, because it takes those CR-2032 disc batteries.) When a new battery didn’t change anything, I turned my attention back to the Boxee+ install. At this point, I switched over to my un-hacked Boxee Box to double check the original settings — and found that box was exhibiting the same behavior. Either there was some Boxee virus going around, or something was going awry with the remote control pairing. A quick Internet search later, the boxes were behaving normally again and I was back to work on the Boxee+ install. 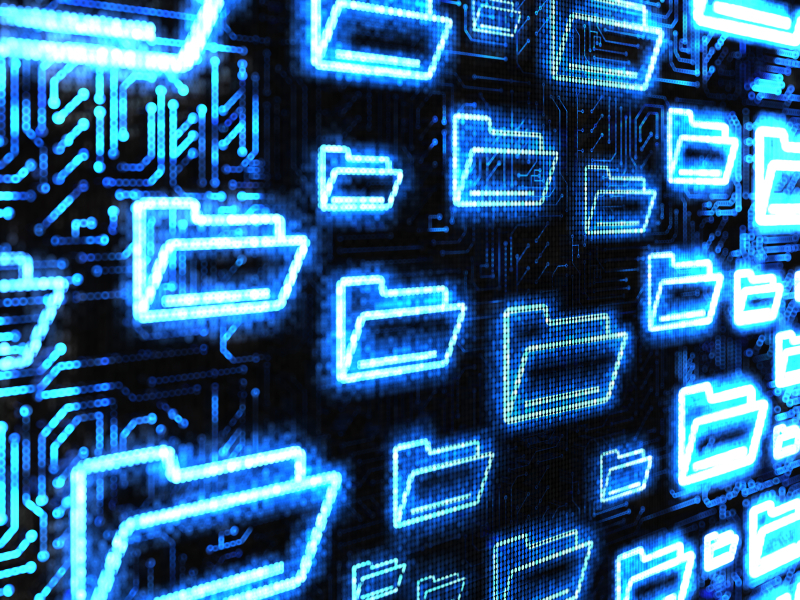 So to install Boxee+ you download a file, unzip it, and copy the contents onto a USB stick (Note: just copy the contents of the folder, not the folder itself.) Then you plug the USB stick into your Boxee Box and go into ‘Settings’->’Network’->’Servers’ where you check a box and add a few characters to a string of text. That’s pretty much it. So is it worth your while to install Boxee+ now? For a casual Boxee user, the subtle changes to the user experience probably aren’t worth the risk of a bricked device. But for those of us with geeky tendencies, the changes under the hood have a lot of potential. And better to try it while there are still Boxee Boxes to be found on clearance, right? That’s monkey as in wrench. 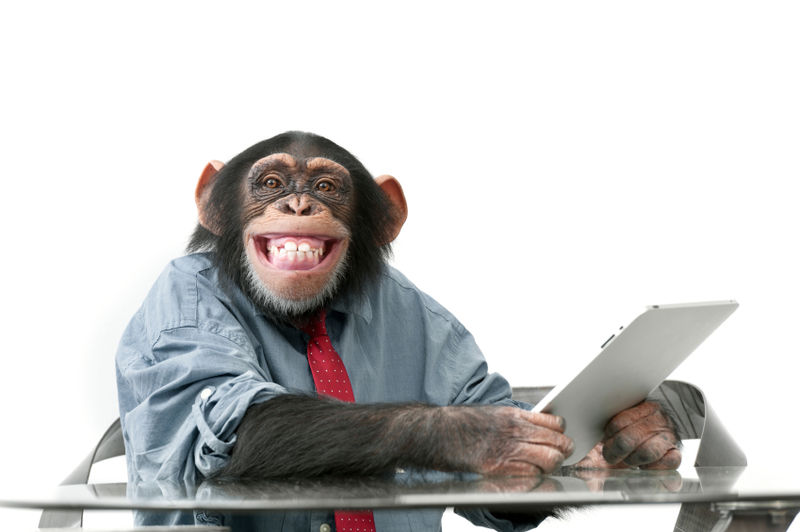 In software lingo, “chaos monkey” is code, developed by Netflix, and aimed, initially, at itself. It’s a “resiliency tool that helps applications tolerate random instance failures” — like, say, when you’re streaming something, and it stops working. So you click it and it starts again – probably from a different server, in a different part of however Netflix configures itself. Chaos monkeys hurtle around, finding faults like that. To be fixed. Welcome to step one in the mental gymnastics necessary to make the inevitable transition from “how things are today,” to “after software devours the world.” It is this: By feeding your work back into the “open” ecosystem, you benefit. You benefit because other people take your progress and further refine it. They’re usually duty-bound to feed their improvements back into the community. Here’s step 2 in getting your head around how software people think: Once you place all of your products and services in the cloud, in one big, unified glob of software, then part of your daily existence is to find your failures, and fix them. Quickly. In software, there’s no taking of two aspirin and calling in the morning. It’s about finding where it hurts, and kicking there harder. We all have our chaos monkeys. Mine of late is iCal, which deletes stuff out of my scheduled life so randomly and completely that a paper Daytimer is on its way. But in for video distribution, chaos monkeys make sense. Moving video over big national backbones, into regional fiber networks, into hybrid-fiber-coax (HFC) plant, to homes, is a lot about load balancing. It’s a lot about making sure that stream leaves the server intact, and gets to your screen intact. Seems inevitable for some chaos monkey action. “It’s understandable that writers sometimes have cause to view ‘curation’ as code for ‘plagiarism,” but there’s a whole other connotation to mine with respect to ‘curation’ and ‘TV everywhere,” he wrote. Good point, Ed. In the TVE world, “curation” tends to pop up in discussions about how to build an on-demand inventory of episodic TV, so as to satisfy the growing mass of us who like to engage in “marathon viewing.” As in watching every episode of Breaking Bad, one by one. Sequentially, yes, but in one or two sittings. This is, of course, confusing to even savvy consumers. You can see Season One of Breaking Bad on your connected TV, but not from your set-top-connected TV. Huh? Or vice versa: You can view a season on demand on the “main TV,” but not on your provider’s tablet or smart phone app. Curation, in this context, also tends to get jumbled up with discovery, navigation, and user experience. When HBO GO makes episodes of Boardwalk Empire available, in a tasteful way, representative of their brand, is that curation, or navigation? Other lingo tends to lurk near “curation,” too – like “full stacking rights,” and “deep library.” A deep library gets one rights to stack inventory such that it extends across all platforms, in other words. Full stacking.